Sen. Mike Crapo, R-Idaho, chairman of the Senate Banking Committee, joined by, from left, Sen. John Barrasso, R-Wyo., Sen. John Thune, R-S.D., and Senate Majority Leader Mitch McConnell, R-Ky., right, talks to reporters as the Senate moves closer to passing legislation to roll back some of the safeguards Congress put in place to prevent a repeat of the 2008 financial crisis, during a news conference at the Capitol in Washington, Tuesday, March 6, 2018. WESLACO — Two days before a major banking bill appears before the Senate, a group of independent bankers visited here to inform local colleagues of what’s looming. The Independent Bankers Association of Texas sees Senate Bill 2155, which would implement the largest changes to American financial regulatory law since 2010, as critical to smaller, regional banks. “A lot of these guys are hampered by it,” said Christopher L. Williston, CEO of IBAT, referring to the Dodd-Frank legislation that was passed in 2010 which he says harms regional bankers. Dodd-Frank was passed in response to the financial crisis of 2008, seeking to stabilize financial systems by improving accountability and transparency. Williston and IBAT are on a barnstorming tour across the state, visiting 18 cities in nine days to educate and answer questions from regional bankers. SB 2155 was part of the focus during Tuesday night’s event here at Arturo’s Bar and Grill, where the group also enjoyed botanas. Dodd-Frank, Williston said, implemented too many new rules and significant paperwork hurdles that tied the hands of many regional banks in Texas. But that could change with this legislation. The bill is scheduled to go to a vote on the Senate floor Thursday after senators Tuesday passed a motion to proceed by a 67 to 32 vote. Texas Republican Sens. John Cornyn and Ted Cruz both voted in favor of the motion. Brookings was encouraged by the process in which the bill was crafted, where hearings were held and public calls were made for proposals to improve financial regulations. 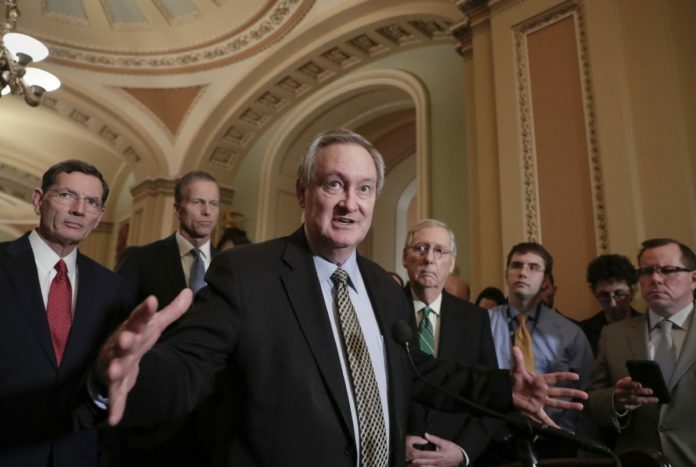 There were also 25 co-sponsors from both parties on the bill, which was authored by Sen. Mike Crapo, D-Idaho. Cornyn and Cruz were not co-sponsors. While Brookings was mostly bullish on the bill, the report noted some drawbacks, such as a concern about the direction of the Consumer Finance Protection Bureau, which Brookings says the bill does not address enough. Sen. Elizabeth Warren, D-Mass., is an active consumer protection advocate who helped establish the Consumer Financial Protection Bureau, which has strong ties to this bill. Warren said Tuesday that while SB 2155 is aimed at helping smaller banks, the bill would put “consumers at greater risk” because it also weakens rules on larger financial institutions. Despite Warren’s efforts opposing the bill, Williston is confident after years of work that it will pass the Senate on Thursday.